North St. Bags provides high end panniers, duffles & totes handmade in Portland, OR. North Street Bags sought to refresh their branding to display a strong, contemporary, and approachable visual identity to accompany their ever-growing business. They wished to keep and minimally update the “North St.” logotype, and explore a secondary graphical mark and icons for sub-brands. 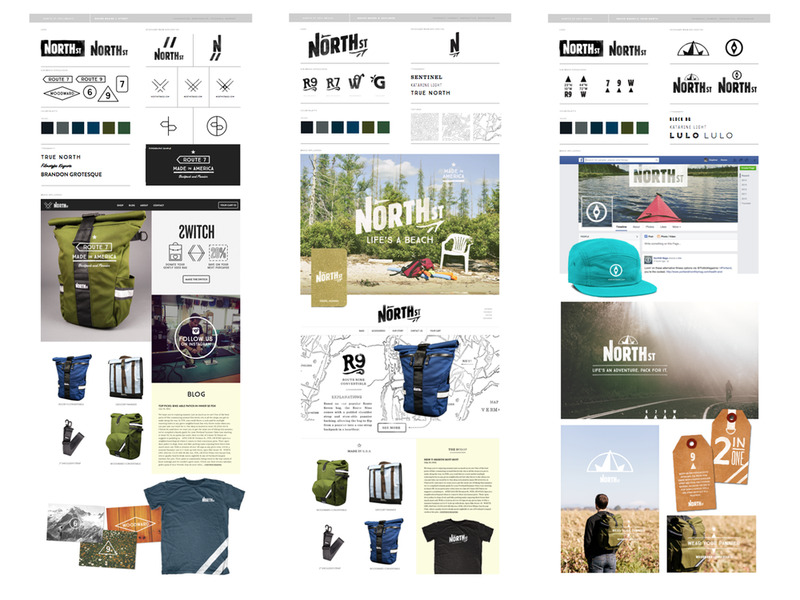 Three exploratory brand boards were created to explore different design ideas, concepts, typography, color, texture, and shape. After discussing the brand boards and choosing elements that worked well, a chosen concept was brought to refinement. A secondary logomark could be useful on product and throughout brand materials. The mark evokes the feeling of a compass, or heading north, as well as a reflection of mountains and nature. Brand guidelines book created with logo usage, color, typography, photography styles, web styles, and design elements and rules. These books are essential to keeping a brand intact over the years.